Preheat oven per cookie package directions. Pat the cookie dough into a 13x17 cookie sheet (one with a lip--these rise and move about a bit!). Bake for about 15 minutes, until top is dry and edges are golden brown. Frost top with white frosting, reserving a tablespoon or two to attach the nonpareils later and a bit more if desired for drizzling over the top. Decorate as desired with sugars and decors. If desired, thin a bit of white frosting to drizzle over colored decorations to achieve the look shown. Allow frosting to set for an hour or two, until no longer runny. Cut with cookie cutter. Attach non-pariels with the reserved frosting. While I truly enjoy cooking, measuring and getting into the nitty gritty of elaborate recipes, that sort of thing is reserved for weekends only. During the week, it’s all on-the-go or assembly style dinners. Or cereal, to be perfectly honest. However, special occasions aren’t confined to Saturdays and Sundays, and tend to occur spontaneously on a random weekday. Which is why I keep a ready supply of standbys for special occasion emergencies! A few steady-Eddie, delicious, but completely customizable base items I have on hand include cookie dough (either in tubes or mix), white frosting, and white cake mix. These create the perfect canvas for the other components of my dessert bling pantry: chocolate chips (white and semisweet); food coloring; sprinkles, sprinkles, and more sprinkles; and extra bling (spray food color, edible glitter, and edible metallic dust). Any of you that read my posts regularly have seen the method to my madness: Purple-rific Cake, Teeny Tiny Rainbow Cakes, Bronie Cupcakes, Double Rainbow Pudding. So, I’m sharing my favorite “there’s a THING tomorrow and I’m up at midnight making and frosting cookies” recipe. Everyone loves elaborately frosted sugar cookies, but who has time to roll out the dough, bake the cookies in batches, and then frost? Not me. 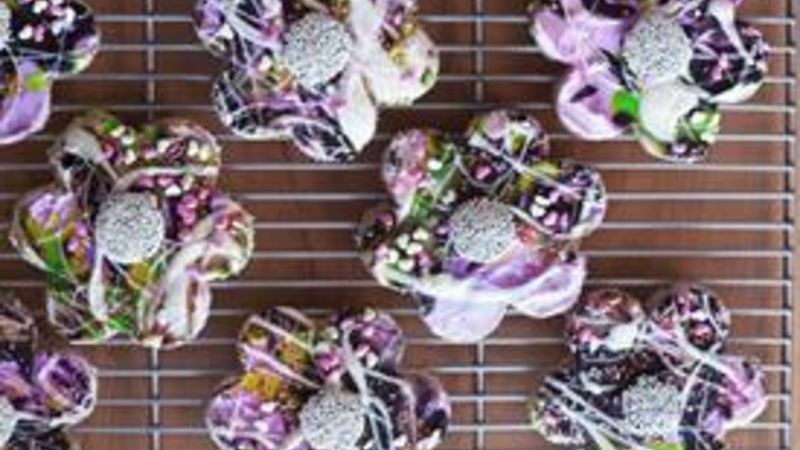 Get ready for Splatter Paint Daisy Cookies! I just pat the pre-made Pillsbury cookie dough into a pan (here I used two rolls of sugar cookie dough on a 13”x17” rimmed baking sheet). You don’t need to grease the pan. I baked at 350 degrees for about 15 minutes. Then, after the pan had cooled, right before bed (when I was looking glam in my jammies and glasses), I frosted the cookies with white frosting and began layering my splatter paint effect. First, a spray of pink and purple food coloring, followed by a couple layers of color: black and lime green frosting (just confectioner’s sugar, milk, and black or green food coloring). Then melted white chocolate, edible pink glitter, edible pink glitter hearts, and some pink and white jimmie hearts. Placed a non-pareil on each flower for the center. And bagged. Done! Anyway, hope you enjoy the method. I can’t really call it a recipe! And don’t forget to stock up on your dessert bling pantry!